Cannabis—you can smoke it, vaporize it, eat it, consume it in sublingual tablets and strips and tinctures and capsules, apply it topically, take a bath in it, and now one of the most exciting and booming categories is how you can drink it. The novelty of being able to drink THC-infused beverages is proving to be wildly popular in the new adult use recreational market, especially beverages that mimic wine or beer (but, to be clear, absolutely no alcohol can be present in any beverages that contain cannabis). Cannabis and beverages were definitely a hot topic at August’s second Wine & Weed Symposium in Santa Rosa, with CannaCraft’s CEO Bill Silver giving the opening remarks and celebrating his company’s release of Hi-Fi Hops in partnership with Lagunitas that week (more on that below). With Constellation Brands—which owns big beer, wine, and spirits brands, including Corona and Kim Crawford—investing $190 million and then another cool $4 billion in Canada’s Canopy Growth (the world’s largest medical cannabis company), you can bet this is just the tip of the iceberg for cannabis beverage innovation and releases. 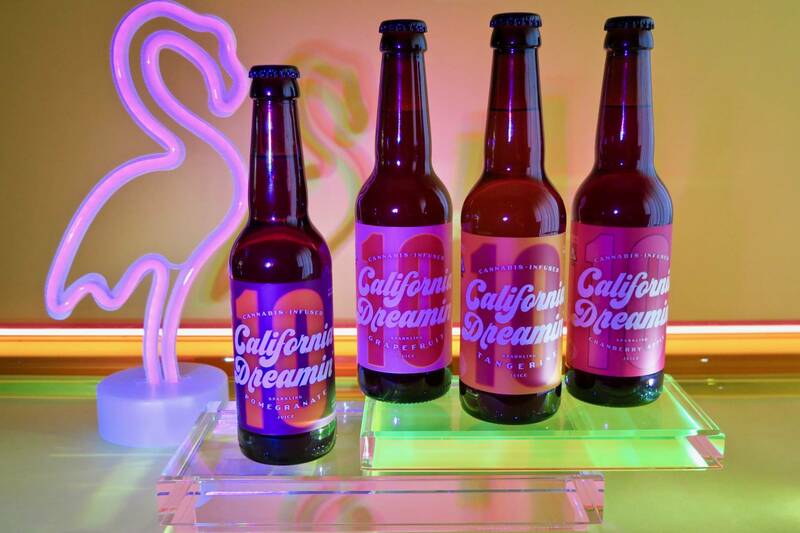 You’ll see many new beverages hitting the Colorado and Nevada legal markets too, but here are five of the latest Californian and compliant cannabis beverages to try. A note on consumption: if you are new (or returning) to cannabis, you should know that psychoactive effects can occur from consuming around 2 to 2.5mg of THC. 2.5mg is a good place to begin, you can always consume more later—give yourself a couple hours to see how you feel after a first dose. Keep it low and go slow. With beverages, they tend to have a quicker onset. You can expect to start feeling a bit lifted and euphoric effects around 10–15 minutes or so (although everyone is different, so give it time). At 10mg per bottle (and more), some of these beverages are built to share, especially if you’re just getting started exploring cannabis. Here’s one of my favorite tricks: if you’ve had enough but want to save the rest of your beverage, try putting the leftovers into ice cubes in big silicone trays (divide it equally so you have an idea of dosage), and you can enjoy them later. It works especially well with carbonated beverages. Save the mixing of these beverages with alcohol for experienced cannabis consumers: alcohol potentiates the effects of cannabis, and vice versa, so tread very carefully in this area. Cross-fading is a slippery slope. One of the biggest sensations to just hit the beverage market is this new cannabis “beer” from a partnership between Lagunitas and CannaCraft (one of their brands is AbsoluteXtracts, famed for their vape cartridges). This nonalcoholic beverage is made with IPA-inspired, hop-flavored sparkling water by Lagunitas and is then infused with sun-grown cannabis by CannaCraft. The line of Hi-Fi Hops includes one can with 5mg of THC and 5mg of CBD (perfect for beginners and microdosers, especially since CBD helps mitigate the effects of THC), while the other can features a dose of 10mg of THC. There’s an easy synergy of flavors from and between cannabis and hops, which is why Lagunitas and AbsoluteXtracts partnered last year on their one-off SuperCritical ale release. It was like Freaky Friday: Lagunitas brewed an IPA with cannabis terpenes (the aromatic compounds), and ABX released a cannabis vape cartridge with hop terpenes (which is still available). In the case of Hi-Fi Hops, the hoppy palate is light and clean, fizzy like a LaCroix, and a little lemony and dry, like a tonic—it’s a lot like drinking a shandy. What’s remarkable about this faux beer is that it’s carb-free and has zero calories, so there’s no beer bloat, but it certainly has its own kind of buzz. It comes on quickly—I started feeling a little pleasantly fizzy in my head after 10 minutes of drinking the 5mg version. Hi-Fi Hops has turned out to be a tremendous hit, and, just a month after the release, CannaCraft has had to quadruple production. Find a list of dispensaries here. This company is the first to release a THC-infused Sauvignon Blanc. Business partners Chip Forsythe (the winemaker) and Josh Lizotte made the S.B. in Sonoma, removed the alcohol, and then added in uplifting, sativa-dominant strains (the THC extract is provided and powered by ebbu, and utilizes their HydroPS solution), plus grape juice concentrate, fruit juice, purified water, and potassium metabisulfite, a preservative agent. It reportedly has a crisp, citrusy, and clean flavor, and comes with some giggles too. Unfortunately I wasn’t able to taste the wine personally because they’ve run out of stock and are looking at another 90 days before it’s available again (so, plan on the end of 2018). The “wine” comes in a 20mg bottle, and the label handily has 5mg markers along the side (go slow). Here’s a bonus: it’s only 35 calories per glass (removing the alcohol also removes the calories, yay). 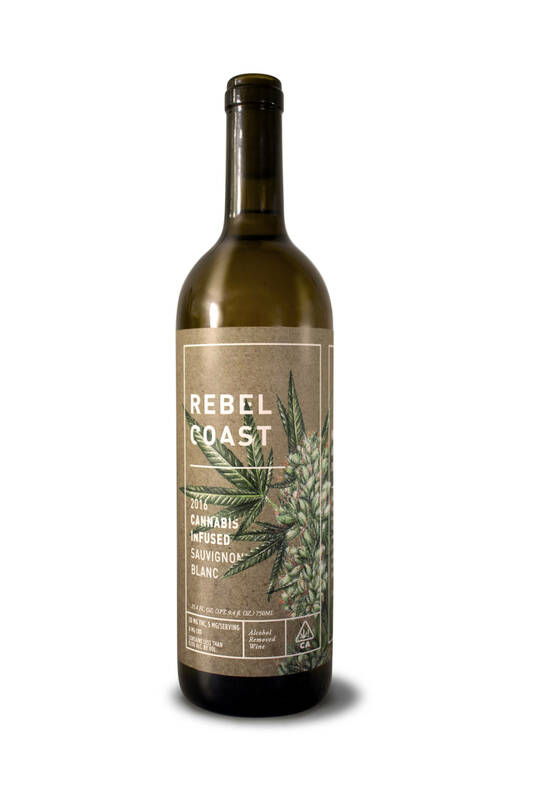 Rebel Coast is reportedly working on releasing a cannabis-infused rosé and sparkling wine as well, and is planning distribution to other legal states and Canada in 2019. 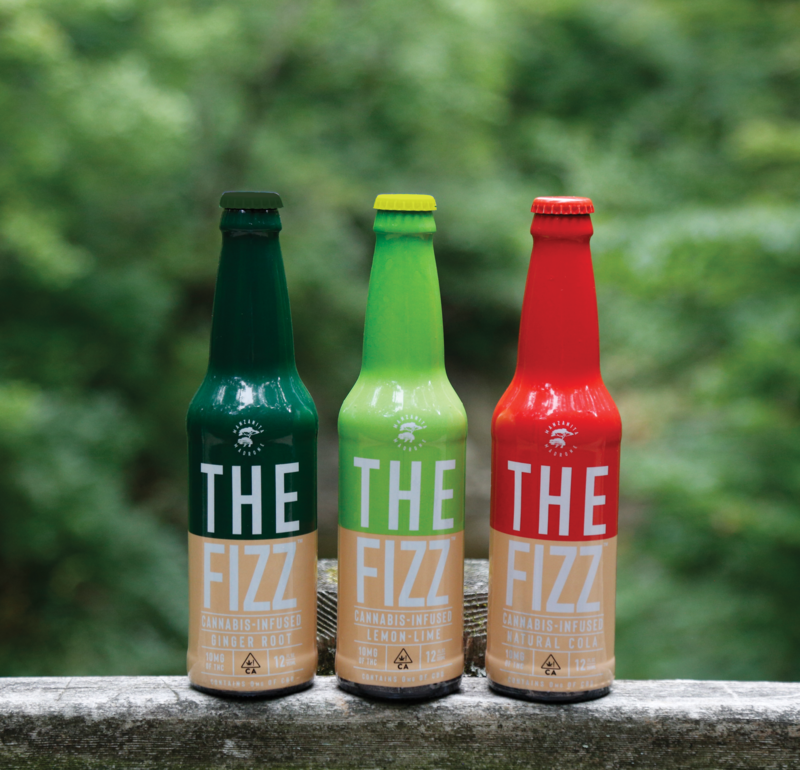 One of the first cannabis sodas to hit the shelves of California dispensaries back in 2017, The Fizz is a line of three all-natural sodas: natural cola, ginger root, and lemon lime. They just rebranded and altered the dosage—each bottle now contains 10mg of THC. Manzanita and Madrone’s brewmasters have over 40 combined years of experience with craft and herbal beverages, which makes these small-batch sodas a cut above others with their refined technique and quality ingredients. For example, instead of using chemicals like sodium benzoate, they use quillaja bark extract (native to Chile) to emulsify their premium, CO2-extracted THC. The ginger root has a great bite and kick (mellowed with a touch of tropical sweetness from pineapple), while the lemon-lime is super quenching like a Sprite. The flavorful and spiced natural cola is made using kola nut, which incidentally is the origin of the term “cola.” Since these sodas are made with respect to their ingredients’ medicinal properties, I recommend trying the ginger when you’re fighting a cold (you can even warm it up), and the grapefruit seed extract in the cola has antioxidant benefits. They taste delicious right out of the bottle (just keep an eye on your consumption) or over ice. Find The Fizz stockists here. This new line of bottled sodas from couple Amy Ludlum and Peter Bishop features four flavors: grapefruit, tangerine, pomegranate, and cranberry apple. Each soda is made with sparkling water and fruit juice, with no sugar added, and they feature a nice tartness and dryness, while the tangerine is a little sweeter than the other three. Each bottle contains a friendly 10mg each, using a concentrate of sativa-dominant strains, so the experience is uplifting and perfect for daytime recreational use (like hanging out with friends and listening to music). Enjoy California Dreamin’ over ice, and they mix well with LaCroix, club soda, and other sodas—you can add fruit garnish to your glass, too. 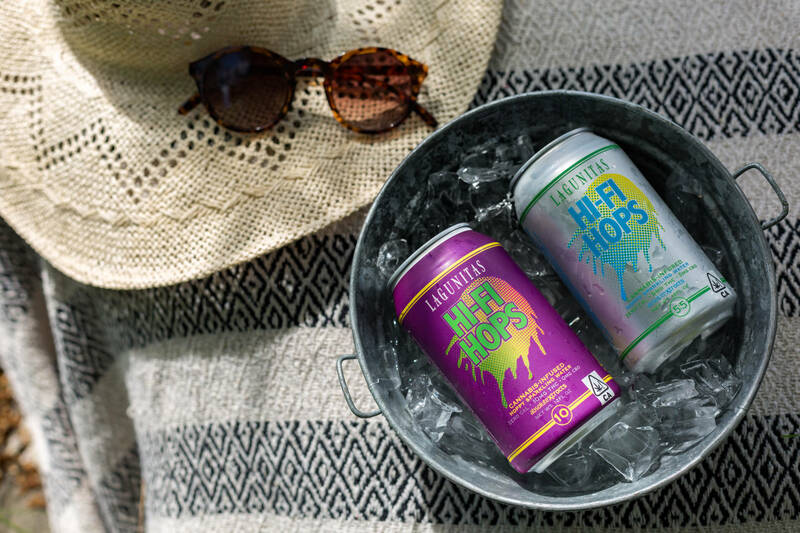 With one look at these cheerful sodas in a can, it’s hard to believe they contain 10mg of THC each, so cannabis newcomers should consider splitting it with a friend—and they don’t look like an obvious THC beverage, so make sure people know what they’re pulling out of a cooler and drinking! The Citrus Original soda is sweetened with cane sugar (but still has 1/3 fewer calories than a can of Coca-Cola), while the Citrus Zero Sugar is sweetened with stevia and erythritol (a sugar alcohol substitute). As someone who prefers cane sugar over substitutes (like stevia), I’d stick with the original, but to each their own. If you want some beverage inspiration, they have a page of recipes here, and these sodas are perfect for beach days and barbecues. 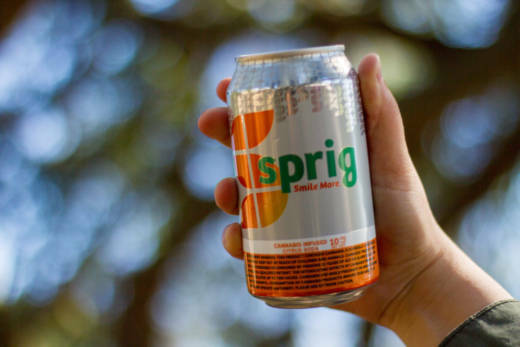 Sprig also has a line of CBD sodas (featuring CBD derived from Colorado-grown hemp), including sparkling citrus (either in the original flavor with cane sugar or sugar-free), along with sugar-free sparkling lemon tea and melon soda. Each can contains 20mg of CBD, enough to deliver relaxed and calm feelings (it’s chillax in a can). These sodas would come in handy after work or a workout, when you want to unwind at home, or even when a hangover strikes. The sparkling lemon tea (which is caffeine-free) made my four-hour road trip a mellow affair (it’s also built for an Arnold Palmer). 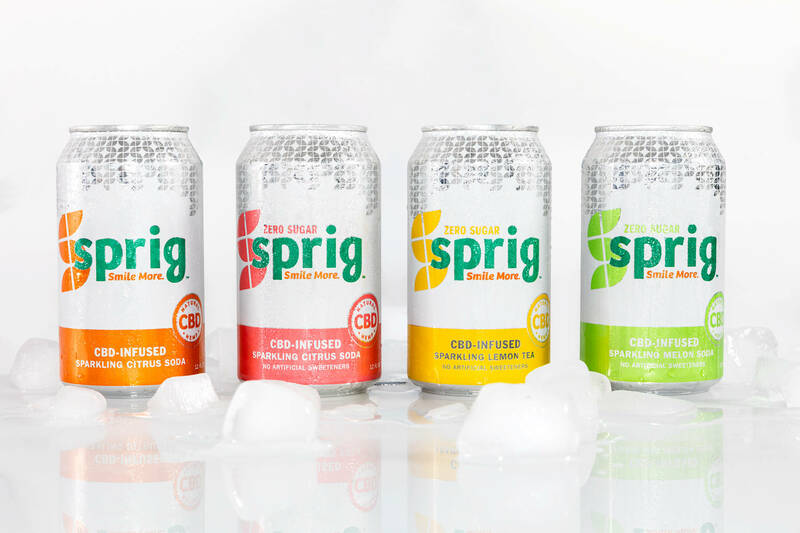 Bonus: you can order the CBD sodas on their site. La Grandeur, a crisp, sparkling cranberry beverage (5mg THC per bottle) is due to come back to dispensary shelves in mid-October (it’s perfect for Thanksgiving!). TSO Sonoma will be launching a THC-infused, non-alcoholic, low-dose rosé that will come in a bottle and a can in 2019. Look for the TSO Infused wine to be served at their TSO Elevated Events first.